If you know me, you know I love a bite-sized treat! 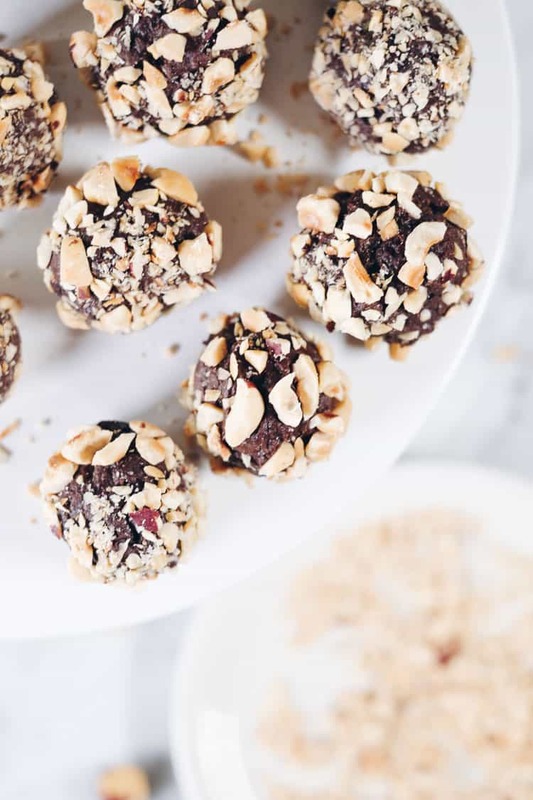 And, I especially love a chocolatey bite-sized treat, like these healthy no bake chocolate hazelnut truffles. They are just the right amount of savory-sweet goodness. 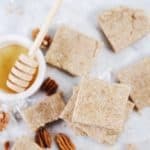 In addition to loving small, bite-sized treats I also love no bake and super easy recipes. 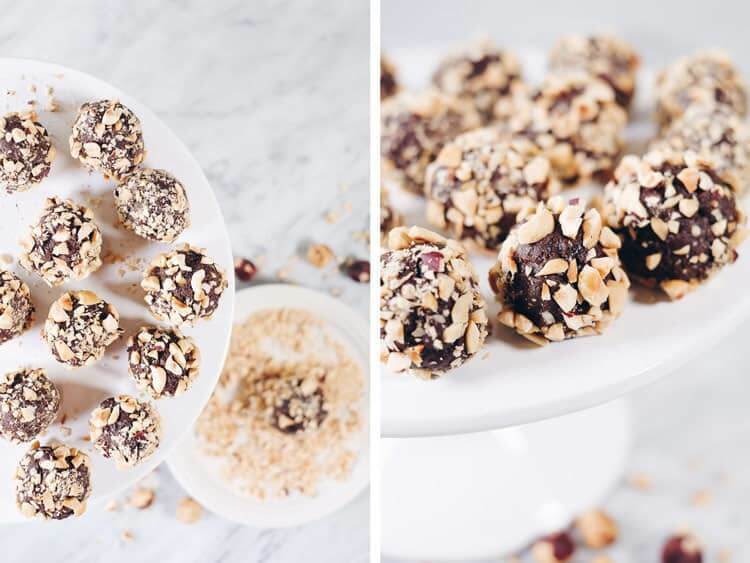 These chocolate hazelnut truffles are pretty much where all my desires meet. 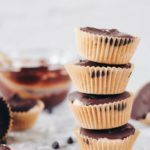 They only have about a handful of ingredients, require no baking (only melting chocolate), and you make them in a mixing bowl with no special kitchen gadgets or tools. I mean, does it really get much easier than that? There is a chocolate hazelnut spread you can buy at grocery stores that I maybe used to have a slight addiction to that is SOOOO full of sugar and other not so great ingredients. Once I started buying real foods, reading ingredients on labels, and just generally making better decisions about my health this indulgent treat and I broke up and parted ways. I do sometimes miss that sweet and savory combination of flavors though. And now that my tastebuds have changed so much, I actually prefer savory with a little bit of sweet. 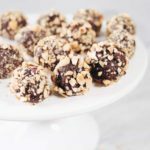 These chocolate hazelnut truffles have these familiar flavors of that unnamed spread I referred to, but with real food ingredients you can pronounce and WAY less sugar! Plus, I managed to sneak avocado in them, so they’ve got good-for-you fats! I love it when I can make a treat with ingredients I almost always have one hand. It makes it easy to whip up a little something when I have the desire or a craving. These chocolate hazelnut truffles have six ingredients in them, all of which you will recognize and can pronounce. First, there are chocolate chips. We get dairy-free dark chocolate chips or a dark chocolate bar with clean ingredients to melt. 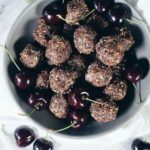 Then, there is a large, ripe avocado, which gives these truffles that velvety texture where your teeth just sink right in and the center feels like it’s just going to melt away. After the chocolate and avocado, it’s just vanilla, cinnamon and sea salt to make the truffle base. Mix it all up and the let it set in the fridge! 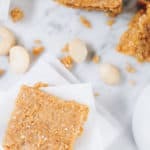 Once set, roll them into balls and then in chopped up hazelnuts, and bam – you’ve got a bite-sized indulgence that is just the right amount of savory and sweet! 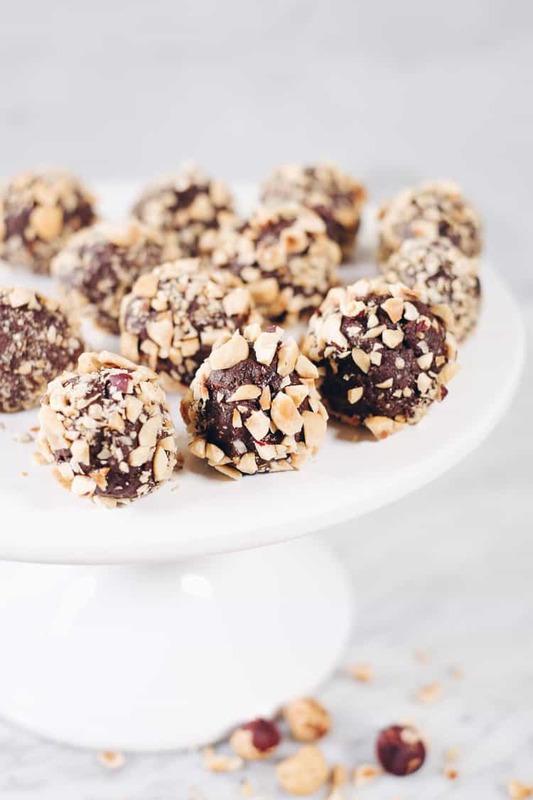 If you’ve thinking about an old favorite chocolate hazelnut spread and want to try a real food treat, make a batch of these velvety chocolate hazelnut truffles. 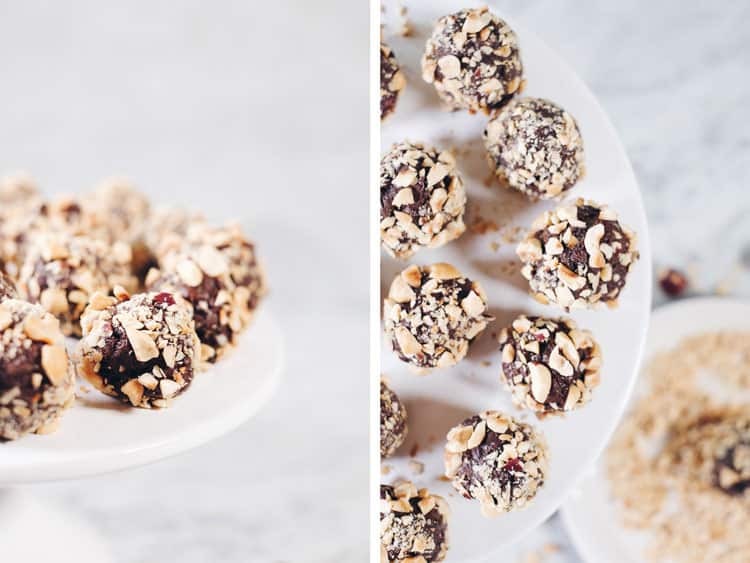 They are the perfect simple, no bake treat to satisfy your sweet tooth. Let us know how it goes by leaving a comment below. Also, take a photo and tag us on Instagram @realsimplegood, so we can check it out! 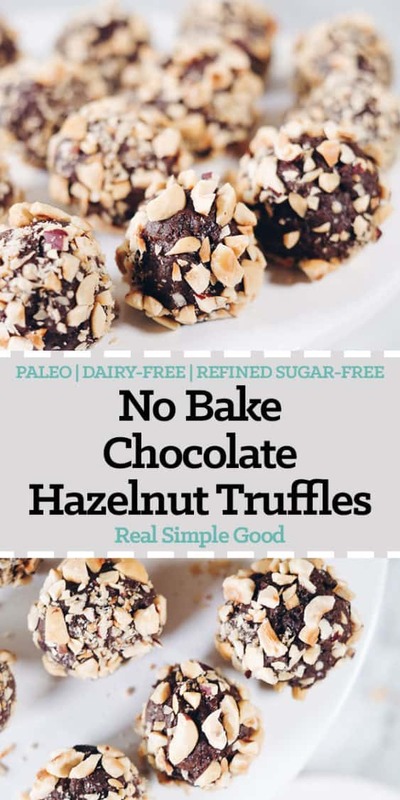 These Paleo chocolate hazelnut truffles are pretty much where all my desires meet. Only a handful of ingredients and no baking required. 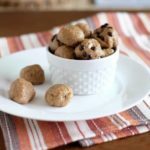 Melt chocolate chips in a double boiler on the stove or in a microwave safe dish in the microwave. If using the microwave, heat in 30 second increments, stirring in between to prevent the chocolate from burning. Mash avocado with a fork in a medium sized mixing bowl getting as many of the clumps out as possible. Add the rest of the ingredients, except the hazelnuts, and mix until smooth and velvety. Place mixture in fridge to harden for about an hour. 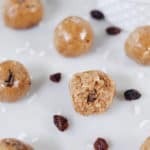 Once firm, remove from fridge and roll into tablespoon sized balls. Then, roll in chopped hazelnuts. I like to add a little more sea salt all over, too. Store in an airtight container in the fridge. But chocolate chips have refined sugar in them, don’t they?